Almost five years since the first stamp paper was stamped at a registrar’s office in Chennai, it might be a good time to share some thoughts and experiences to deter other thoughtful, unsuspecting souls from attempting something similar. One reason there has been a fall (okay, precipitous fall) in the frequency of posts on this blog is that the day-to-day challenges of building an upstart think tank drain one’s time and energy. Another is laziness, lethargy and procrastination. Yet another is twitter, which is still the path of least resistance for the current of thought to reach the ground of public discourse. Laziness and twitter are easy to understand reasons, but what is this business of building a think tank? Almost five years since the first stamp paper was stamped at a registrar’s office in Chennai, it might be a good time to share some thoughts and experiences to deter other thoughtful, unsuspecting souls from attempting something similar. This post is written with the intent of being the first in a series. But just like how N is initially unknown in a 1/N series of tweets, it is by no means certain that this series will be any longer than this first post. With that disclaimer, let us look at two of our core values: funding, and independence & non-partisanship. 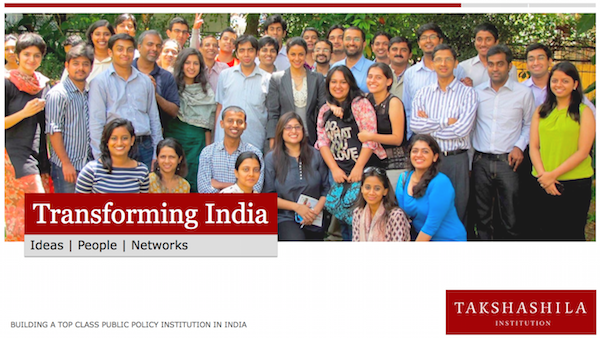 From the outset, Takshashila’s founders decided that the organisation, a non-profit public charitable trust, will operate solely on Indian money. After all, it would be ironic for an ambition that reads “building the intellectual foundations of an India with global interests” to be financed with foreign donations. Also, foreign funding would hand detractors and opponents of our ideas a convenient handle to deliberately mischaracterise our public policy arguments as playing to a foreign agenda. Since many of the arguments that we make ruthlessly in the national interest are counter-intuitive, they are vulnerable to smear campaigns. Imagine arguing (as we have done) for 100% FDI in defence production with an unconditional, unrelated grant from a respected foreign foundation. The elimination of foreign funding has made life a lot more tougher than it could have been, but since we are set for the long haul, it is a price we have happily paid. Maintaining independence and non-partisanship the other hard challenge, and one we’ve managed to address quite well. First, while it is relatively easy to manage an organisation (a private corporation, an association or a political party) that has an official view that everyone must fall in line with (or leave), it is much more difficult to manage one that doesn’t. A think tank and a public policy school cannot function effectively unless its members have full intellectual freedom. Yet when this freedom causes a diversity of opinions to be expressed, there is often a internal tension among those supporting different positions, and an external confusion as to whether the institution supports one or the other view. The one on whose shoulders falls the job of managing the institution, yours truly’s in this case, has to act as a mediator, negotiating platform and conciliator internally, and an official disclaimer-issuer and ‘brand manager’ externally. This is not easy. Worse, in a small start-up institution like ours, there is always the possibility that my own views–and those of the other co-founders–are conflated with that of the organisation’s, which sometimes leads to pulled punches, less trenchant blog posts and blander language in newspaper columns. Since 2010, public discourse in India has become edgy, sharply divisive and polarised. Everyone is quick to paint an unfamiliar or unsavoury opinion as an attack on one’s favoured politician or party. The political campaigns of the 2014 general election had massive online components, and online political entrepreneurs seeking to gain political prominence and spoils of power by attacking ‘the other side’. So Takshashila was on Congress payroll for the BJP’s vociferous online partisans (who we endearingly call “the wrong wing”), an RSS front for the Congress’s beleaguered but spirited online brigade and pro-corruption for Anna Hazare & Arvind Kejriwal supporters. The Communists somehow forgot to attack us, which is perhaps an indication of their irrelevance, or ours. Kabira had gone to the bazaar to ask for everyone’s well-being, but ended up being attacked by them all. There is a lesson in this which we took and we teach. Another interesting phenomenon was that those who donated to us—including Rohini Nilekani, our first donor—did not once even hint what positions Takshashila should or shouldn’t take. But those who didn’t give us any money often vociferously insisted what political positions we should take for our own good. It is now not too hard to detect political partisans pretending to be broad-minded philanthropists. It is also heartening that there are enough of the latter to lend their support to us, in big or small ways. I have always found the allegation “you are saying this because XYZ is your donor” an indication of the person making the allegation projecting his own values on his target. As acts of honour and integrity even in today’s famously compromised media industry show, not everyone who draws a pay cheque necessarily dances to the tunes of the owners or donors. For small startups like ours, with low stakes, it is relatively inexpensive to be independent and non-partisan and call things as we see them. Judgement calls on the safety of our members and their families apart, there is little to make us toe anyone’s line. So we merrily advocate what we see as the national interest, and we try to persuade others to see things our way. This does not mean that we are “neutral”. Our ideological leanings are openly advertised: freedom, a culture of tolerance, an open society and strengthening India’s national power. These set of ideas can be called “liberal nationalism”, but it is the values that matter, not the label. The biggest asset Takshashila has today is the goodwill of its supporters and the credibility among a small section of India’s elite. Our success will continue to come from this, hopefully growing constituency.